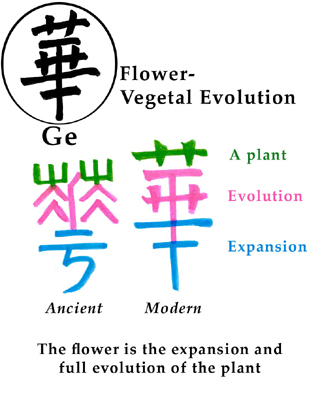 Hua1 Hua1 is the same hua used in ren of renge. It means vegetation. Hua2 Hua2 is a composite. The modern hua2 looks like a square net on a pole. The primitive images yu and hua3 compose hua2. They are unrecognizable in the modern form. Click here for a full-size printable version of the explanation of Ge (at left).